We are a leading name in the market as brass wire manufacturer. 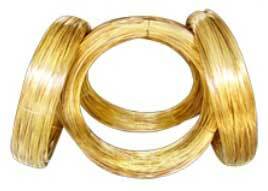 Our brass wires are available under the brand name "UNICUT" in different grades. These wires are chemically pure as Zinc and Copper and are also welding free in single melting lengths. 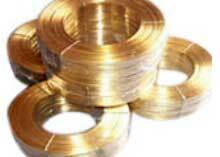 The brass wires are available in coil form and EDM Wire is in different type plastic spools/reels. They can be used for springs, clips, pins, nut bolts, brushes and have numerous of other applications. 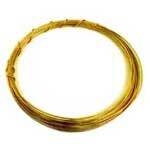 Brass wire is available from size 6.00 mm to 0.5 mm in coils as per ISS & BSS and other international standard. 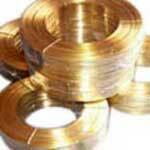 We are reckoned as one of the most trustworthy brass wire suppliers of India. Impurity Content:- Our integrated production from virgin material. Processing minimizes the content of impurity which impairs the mechanical properties of the wire at high temperature and loss power. Superior Mechanical Properties:- Uses superior quality virgin raw material free from impurities, ensures uniform chemical composition and optimum cutting performance with good job finish. Quality Development:- The plant follows complete testing of products and has dedicated R&D facilities to ensure best quality products. Through feedback of our esteem customers our R&D Dept. modifies the existing process for achieving their perfect requirements/needs. Smooth Wire Surface:- Uses of highly quality dies material and Strict dies maintenance & the special treatment assures wire surface smooth & bright finish, free from flaws/dust/rust and grease that cause inefficient electric discharge. High Dimensional Accuracy:- Due to the control system of high quality diamond dies and lubricant to ensure the close accuracy of wire diameter is precise within +/- 0.001 mm tolerance. 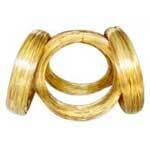 No scratch, cracking, twisting and deformation can be found on our wire. No Weldment:- The rough surface caused by welding could affect the quality and accuracy of performance. 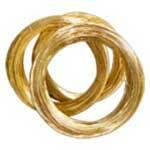 The welded wire tends to bread which results in lost time to re-thread. 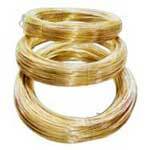 High Tensile Strength:- Assures optimum cutting speed and minimizes wire breakage Tensile strength. Size -the size is available form 0.100mm, 0.150mm, 0.200mm, 0.250mm, 0.300mm & 0.350mm, we can also provide size as per requirement of our customer. No Acid-corrosion and No Damage to Resins:- The special treatment avoids acid-corrosion on machine and work piece. Filtered water and pH will not be damaged. Thus lengthens the life of the ion resins and filters. Superior Straightness:- Straight wire assures successful auto-wire threading and perfect straightness. Protective Packing:- Each spool is individually wrapped from Polythene bag for protracting against dust and oxidation, This polythene-wrapped spool is placed in a cardboard/thermocol box. Each box is packed in a cardboard/wooden case of capacity of 25Kg. to 50Kg. as per destination wise. The â��Unicutâ�� wire scores on high quality, faster cutting speed, high cutting accuracy and precision meeting the critical challenge of increasingly sophisticated EDM requirements. Widely Accepted: The â��Unicutâ�� wire is completely accepted by our esteem customers in Nationally & Internationally in following type of Wire Cut Machines :- Electronica, Japex, Sodick, Fanuc, Charmilles, Agie, Makino, Chmer, Jaymass, Brother, Mitsubishi, Hitachi. To enquire about the desired product(s), just check the box and then click "Inquiry Now" button which is provided below.